"We think cooking is really important — especially now. Over the past decade, many studies and books have shown that children from families who eat together do better in school, that eating "whole" foods is healthier, that eating sustainably will save the environment. But no one has pointed out that the only way to achieve all this in a comprehensive, lasting way is for people to cook." Pretty cool, right? Anyway, while I was filling out my new profile, I was asked "what do you cook when home alone?" Well, I usually cook everything while home alone, but I answered with my honest favorite: hearty, chock-full veggie "Stone Soup" style soups. Case in point, I present to you this Italian Wedding Soup with Turkey Meatballs recipe. The term "wedding soup" is actually a mistranslation of the Italian phrase "minestra mariata", which refers to the adage that dark green vegetables and meats cook well together. To keep this soup healthy, I used lean, all white-meat ground turkey instead of the typical beef/veal/pork meatball combination. I loved the effect the turkey had in this soup: the mild meatballs fared perfectly in the hearty, leafy soup. Ground turkey meat is usually dark, and while it is definitely leaner than beef, white meat is the healthiest of them all. The light pink meat produces an almost whitish color upon cooking, like chicken, which may aesthetically throw you off. Therefore, using the white meat as meatballs in a soup, where the color doesn't stand out so much, is optimal. I used fresh meat from DiPaola Turkey Farm, which raises free-range, antibiotic-free turkeys fed a mixture of corn and soy. The magic of this recipe lies in its simplicity. 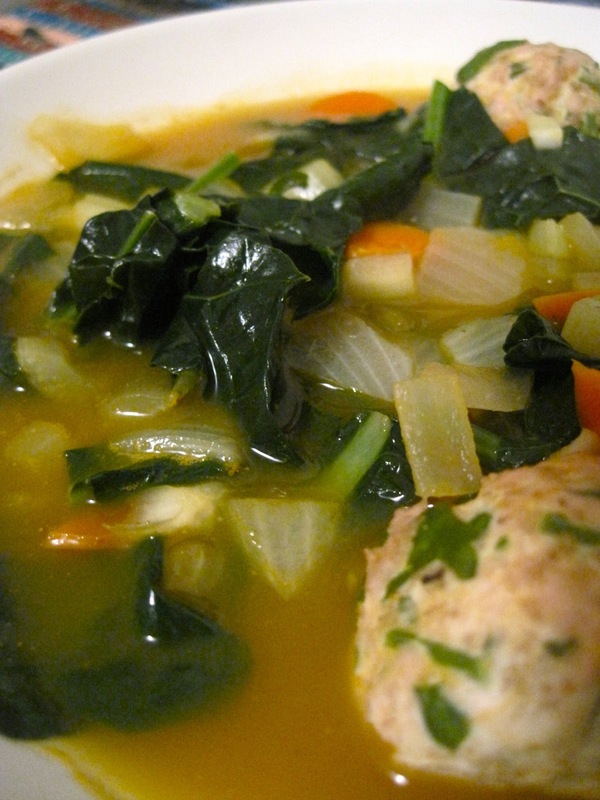 In a showcase of fresh flavors, the ingredients speak for themselves: garlic, onion, celery, carrots and kale/escarole simmer in a lush broth, accompanied by the hearty meatballs, tinged with parsley and oregano. Ample salt & pepper and a light sprinkling of shaved Parmesan top it all off. There are tons of other things you could add— thyme, diced tomatoes, cannelloni beans, mushrooms— but here, the "less is more" phenomenon triumphs. In a mixing bowl, combine ground turkey meat, bread crumbs, egg whites, 1 clove garlic, oregano, parsley, 3/4 teaspoon kosher salt, and 1/4 teaspoon pepper. Form into 1-inch meatballs, place on a baking sheet, and refrigerate. In a Dutch oven, heat oil over medium-high heat. Add onions and garlic, saute for 5 minutes. Add celery and carrot and saute 5 more minutes. Add stock and 1 teaspoon salt. Turn heat to high. Once boiling, add kale and escarole. Turn heat back down to medium-low, cover Dutch oven, and simmer 15 minutes. Italian soup looks yummy. Thanks for giving this recipe. I will try this at weekend. I like various cuisine food very much. I like Italian culture, tradition, Italian food etc . Last summer I have visited Italy as well as I have visited italian restaurant. I like to drive Italian road at night . I have enjoyed Italian food very much.